The Filter Modulator board performance is sensitive to 3rd harmonic content from the square wave output of the ADF4351 synthesizer so, to achieve good MERs, pre-filtering of the input from the ADF4351 should be used on 71, 146 and 437 MHz. The BATC LO Filter board reduces the 3rd harmonic content of the drive to the Filter/Modulator board. The "Black" eBay ADF4351 modules do not provide as much output as would be expected from the Chip specification. However, it is perfectly adequate for our needs. 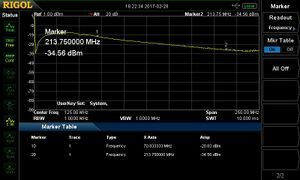 The ADF4351 can be set to 4 levels, at 3 dB intervals. By default the Portsdown software sets it to the lowest level, 0. This table shows the levels at each stage in the system with the VCO Filter Board when adjusted for best results. Note that the 3rd harmonic level is only included for reference; it is not possible to adjust this level without circuit design changes. The 2400 MHz readings are included for information only - although it may be usable, this frequency is way outside the specification of the LO Filter board. 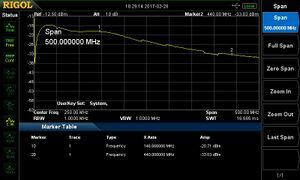 Here are the values that are achieved on 437 MHz and 146.5 MHz without filtering. The MER is significantly reduced and the constellation has a trapezoidal pattern. This page was last modified on 4 June 2017, at 22:16.